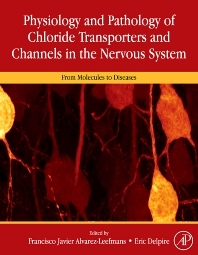 The importance of chloride ions in cell physiology has not been fully recognized until recently, in spite of the fact that chloride (Cl-), together with bicarbonate, is the most abundant free anion in animal cells, and performs or determines fundamental biological functions in all tissues. For many years it was thought that Cl- was distributed in thermodynamic equilibrium across the plasma membrane of most cells. Research carried out during the last couple of decades has led to a dramatic change in this simplistic view. We now know that most animal cells, neurons included, exhibit a non-equilibrium distribution of Cl- across their plasma membranes. Over the last 10 to 15 years, with the growth of molecular biology and the advent of new optical methods, an enormous amount of exciting new information has become available on the molecular structure and function of Cl- channels and carriers. In nerve cells, Cl- channels and carriers play key functional roles in GABA- and glycine-mediated synaptic inhibition, neuronal growth and development, extracellular potassium scavenging, sensory-transduction, neurotransmitter uptake and cell volume control. Disruption of Cl- homeostasis in neurons underlies pathological conditions such as epilepsy, deafness, imbalance, brain edema and ischemia, pain and neurogenic inflammation. This book is about how chloride ions are regulated and how they cross the plasma membrane of neurons. It spans from molecular structure and function of carriers and channels involved in Cl- transport to their role in various diseases.